For the second year running, Pegasus Opera is presenting the UK premieres of two one-act operas – one serious, one comic – by the American composer Philip Hagemann. Hagemann, who once again conducts, makes atmospheric and graceful use of the instrumental ensemble, especially the woodwind, in The Nightingale and the Rose, which retells a story by Oscar Wilde. Waltz rhythms are at the heart of the score and pulse through the consoling final ensemble that Hagemann appends to Wilde’s romantic, but ultimately bleak, tale. Appropriately for a creature that dies to further human aspirations, Katie Grosset brings a dramatic vocal edge to the Nightingale’s effusions. As the Student desperate for a red rose, baritone Nicholas Morton handles his arching lines with assurance and Thomas Bennett, as a rose tree, is solid as a mighty oak. The Music Cure, setting a satirical playlet by George Bernard Shaw, centres on a government official accused of insider trading and plagued by guilt. After an obliging doctor has prescribed him opium, he receives a visitor to his hotel room – a formidable female pianist. The text is closely packed and Hagemann’s score, accommodating a slew of quotations from virtuoso piano works, is almost relentlessly busy, but every word tells in the singers’ finely judged comic performances: Peter Brathwaite as the distinguished, deadpan doctor, Alison Buchanan as the sumptuous-sounding Strega, and Oliver Brignall, elastic of voice and body as Reginald. 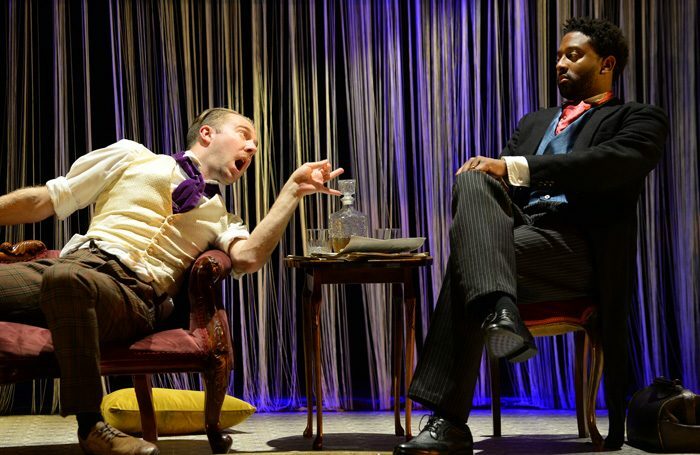 Louise Bakker’s production has its whimsical moments in the Wilde, though it makes imaginative use of video, but the Shaw, set in an opulent Edwardian room, cracks along.